M012912 – Gun charging microbore hose 500mm with 1/8 BSPPF connections and anti-kink spring. 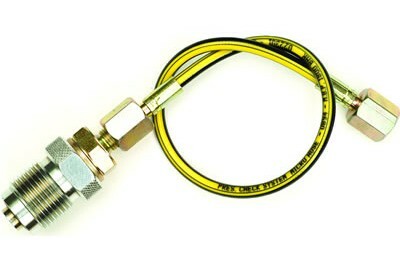 M012911-1 – Gun charging mircobore hose 1m with 1/8 BSPPF connections. H012910 – Hose assembly, complete with (H041795 DIN male, M013718 Bonded seal, M013717 male/male adaptor and M012911 Charging hose ). Designed for our Airgun Charging Cylinders, this hose assembly fits directly into our Airgun Valve and provides a standard 1/8BSPPF outlet for rifles including Air Arms and Daystate. M012907 – Gauge 0-315 Bar (4600 PSI) 1/4 NPT Bottom entry 50mm (fits DIN and A-clamp charging systems). G021359 – Gauge 0-270 Bar (4000PSI) 1/8 BSPT Back entry 40mm (fits 232 pre Jubilee range, gun valves). G021377 – Gauge 0-400 Bar (5800PSI) 1/8 BSPT Back entry 40mm (fits 300 pre Jubilee range, gun valves). 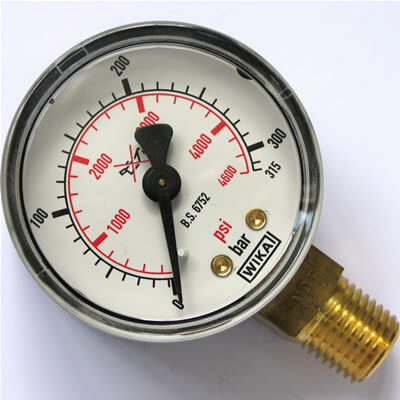 L100005 – Gauge 0-400 Bar (5800PSI) 1/8 BSPP Back entry 40mm (fit Jubilee gun charging range). 2122260 – Gauge plastic window Only, 400mm (fits Wika brands G021359 & G021377). M035706 – Bonded seal 1/8 BSP. M013703 – Bonded seal 1/4 BSP. M012701 – Acetal seal 1/4 BSp. (4.75mm Thick white). M012908 – Adaptor 1/8 x 1/8 BSP Male/Male 60° internal Cone. M013717 – Adaptor 1/4 x 1/8 BSP Male/Male 60° internal Cone. M013718 – Adaptor 1/4 x 1/4 BSP Male/Male 60° internal Cone. M041000 – Adaptor 1/8 BSPM x 1/4 BSPF (includes seal). H041795 – DIN Male x 1/4 BSPPF including Acetal Seal (Rapid 7 – Super10 Adaptor). H013301 – A-Clamp block with 1/4 BSP Female with seal (for buddy bottle). 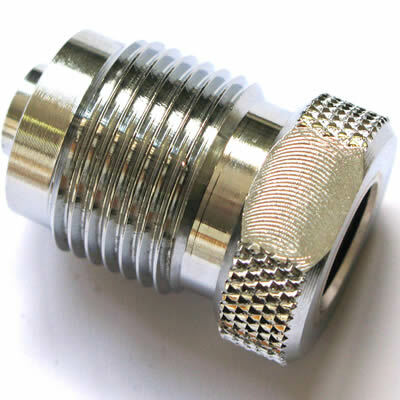 H012912 – Quick connector kit, comes complete with fittings and seals to fit both airgun and flexible hose (additional male ends available for those who have more than one airgun). H029110 – Bleed Screw including insert. M015030a – Insert of Bleed screw only.